Wanna know what one of our all time favorite go-to hairstyles is for the ultra hot months? The top knot, of course, because it serves multiple purposes. For starters, it gets all that hair off your neck and, consequently, keeps you cool. Secondly, it looks pretty darn cute and can be dressed up or down and accessorized to your heart’s delight. Today we’ve got seven different top knot styles for you to draw inspiration from. May you go forth and don the prettiest top knot of them all. Jenny from The Confessions of a Hairstylist blog kicks off our list today with not one, but two different “alternate top knots” for you to choose from. The first is a voluminous style and the second is more petite and incorporates a pretty braid into the mix. Check out the video blog post, which features Summer Bellessa from The Girls with Glasses show, for all the info you need. Dirty hair? Pull it up into a top knot! 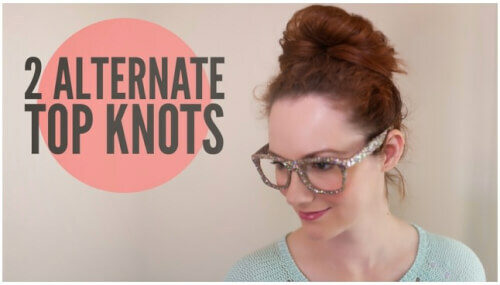 This messy top knot tutorial by Merrick of MerricksArt turns the messiest, dirtiest of hair days into one that’s glamorous and fashion-forward. 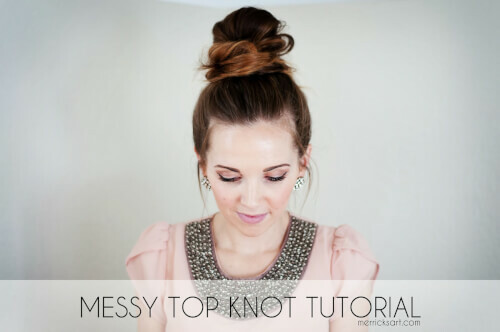 Merrick uses a figure-8 motion, which she explains in the blog post, to create a very loose and “messy” top knot. If you’ve got medium to long hair, this one’s for you. “I have come to save you from the tyranny of a million bobby pins,” exclaims Alle from xoVain. She rocks a pretty sweet lob and teaches fellow shorties how to create three different hairstyles. Two of them are topknots that incorporate an upside down French into the mix. She calls the first a “criss-crossed bun” and the second a “Modified Betty Draper.” You’ll see why the latter is referred to as such when you check out the post! The easiest way to a super voluminous topknot is via hair extensions. YouTube user and hair guru Dirty Looks demonstrates that even if you’ve got relatively fine or short hair, you can totally fake volume with a little help from faux hair. If you’ve been wondering how to incorporate those extensions into an updo, now’s your chance. You’ll need a hair donut, extensions and a brush. TRESemme stylist Jeanie Syfu walks you through this “windblown top knot” video hair tutorial on YouTube with reporter Louise Roe. The look was actually inspired by the Marissa Webb show at New York Fashion Week 2014. As with any top knot, you’ll want to pull your hair all the way up to the top of your head and then gently tie it into a high ponytail. 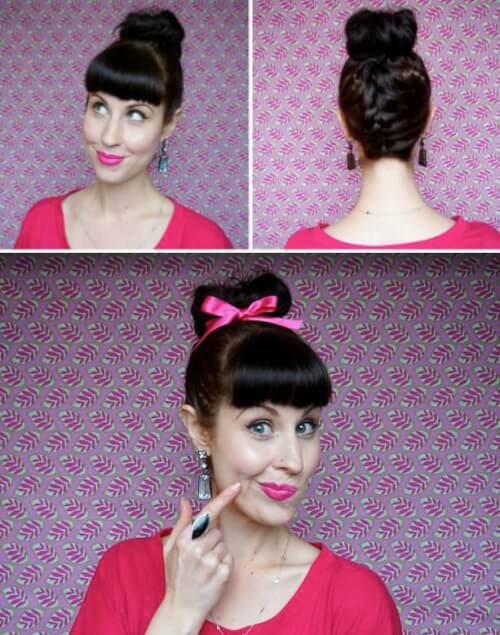 From there, wrap the hair around really loosely and pin into place with large pins. The large pins contribute to the messy finish. Finally, you’ll use your fingers to create that windblown texture effect.